Kids, girls specifically, absolutely love playing with dollhouses, and for a reason. A dollhouse can open up many new possibilities in terms of creativity (children are able to come up with different scenarios and compose exciting stories) and kids do love using their imagination. Aside from encouraging the creative side in children, dollhouses through pretend play contributes to children’s cognitive development. Because pretense play plays a vital role in the mental and behavioral development in young children, parents should include pretend play toys more in the every day playing. Mainly because long-term capabilities related to problem solving as well as to literacy and other skills involving different brain functions are more likely to thrive. Although such findings have had little or no influence on schooling practices, recently, due to parents’ and pediatricians’ emphasis, the toy industry has put more focus on developing more engaging pretend play toys. From kitchens, hero play, workshops & tool sets to dollhouse online and offline markets offer a large diversity suitable for different age groups. Dollhouses for example, come in a variety of designs and with different features. From wooden to 3-level houses, most models are very easy to assemble and come with various accessories perfect for inspiring imagination and creating make-believe games. Such accessories include a fireplace that lights up and makes sound, a hanging chandelier, a clock, pieces of furniture with doors that open and close, dressing tables with mirror and many more. Depending on the brand, parents can even find dollhouse online that feature a beauty salon, lounge area, and even a veterinary clinic. However, buying the right dollhouse requires plenty of research. For example, take size into consideration. Kids may lose interest in playing or have hard time playing with too small or too big dollhouses. To prevent aggravation, measure the area where you plan to keep the dollhouse first and stick to the measurements when selecting a dollhouse. Also, keep your child’s age in mind; dollhouses are designed for specific age group – some come with features more appropriate for preschoolers while others are safe for toddlers. And last but not least, choose a durable design and a dollhouse that features a variety of themes. Although we associate a dollhouse with playing, it is more than just a toy. Back in 1500s dollhouses were the symbol of elite and royalty. In fact, back then dollhouses were designed primarily for adults and privileged children and were mainly used as an educational tool. These dollhouses were hand-made and pricey. Today, some are even valued at over 1 million dollars. Shocking, right? 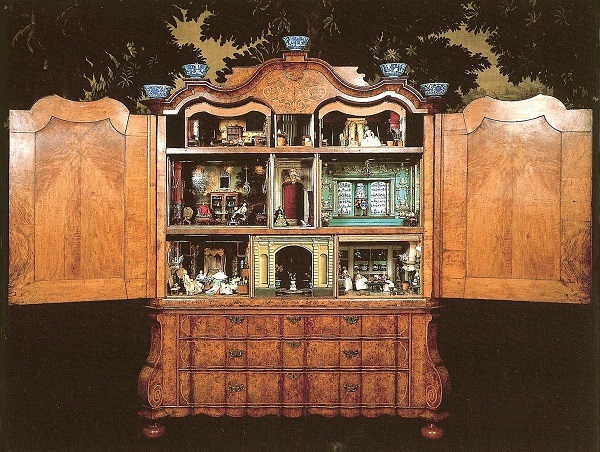 This twelve-room dollhouse is currently on display in the Netherlands. It was owned by Sara Rothe, a well-known 18th century art collector (she was married to a wealthy merchant). It features doubled doors, a dining room equipped with forks, knives and plates all in pure silver, a library full of miniature-sized books, and the walls of house display miniature paintings done by famous artists. This dollhouse was created by the couple Kevin Mulvany and Susie Rogers, who needed jaw-dropping 10,000 hours to finish the project. 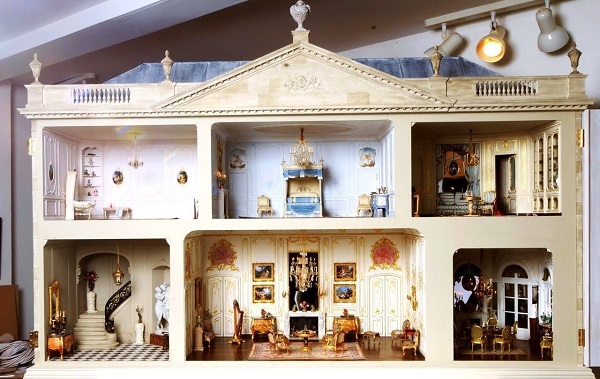 The dollhouse has six rooms and includes furniture made from special wood, real crystal chandeliers and miniature hand-painted porcelain dinnerware made by famous European porcelain manufacturer Sevres. 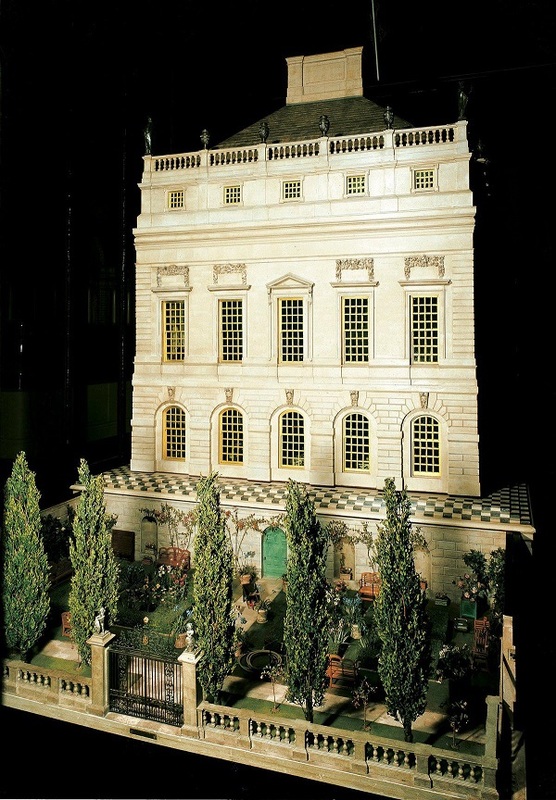 In 2009, the dollhouse was estimated at a value of $70,000. This Victorian-style mansion took a construction company owner, Peter Riches (a 69 year old resident of Sussex, England) 15 years of dedication to compete it. He began working on this detailed mini-home project in 1994 and finished it in 2009. The English Gothic House has 10 bedrooms and 23 rooms and includes a pool table, a grand piano, a servants quarter and a library room with 1,000 separately bound books. The dollhouse now belongs to a Canadian dollhouse collector who paid $82,000 for it. This dollhouse was built by the American silent film actress Colleen Moore. It took her 7 years to complete it, from 1928 to 1935. The elegant twelve-room castle has a great hall, a drawing room, a library, a chapel, prince’s and princess’ bedroom and bathroom, a magic garden, an attic and chandeliers made of pure gold and diamonds and fairy-tale scenes incorporated all over. 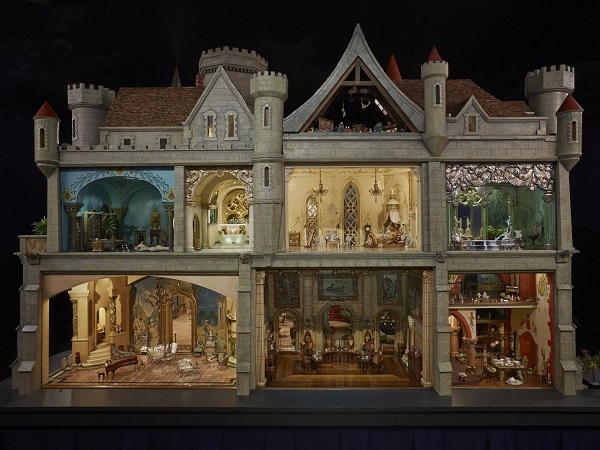 More than 700 people with different industry background and work experience participated in the creation of this dollhouse, including Walt Disney. This dollhouse is currently on display in the Chicago’s Museum of Science and Industry. 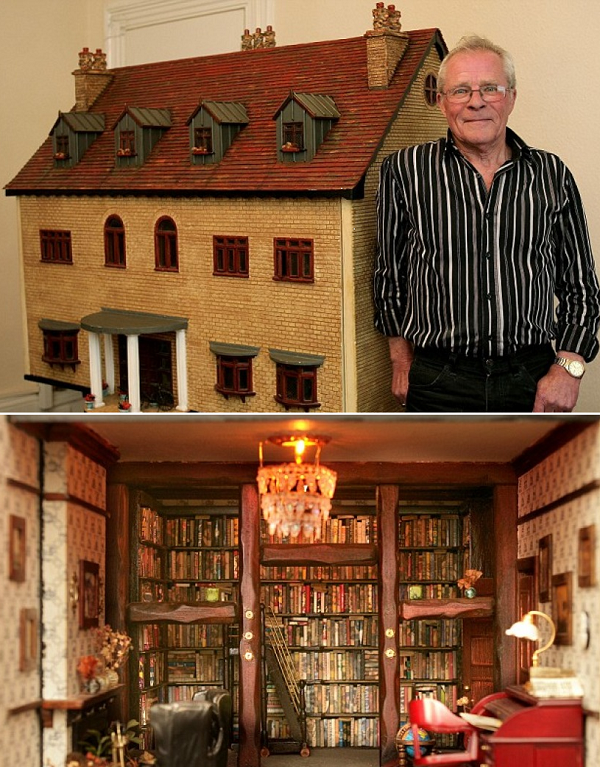 This is probably one of, if not the most exceptional dollhouses ever created. Princess Marie Louise (Queen Mary’s cousin), partnered with renowned British architect Sir Edwin and more than 1,500 craftsmen and artisans to complete this project. The dollhouse has toilets flush and cold and hot water actually running through small pipes. Even the bottles in the wine cellar are filled with different wines and spirits and the library is filled with seven hundred paintings done by popular artists and more than 300 books. The dollhouse was the gift for Queen Mary, as a gratitude for her dedicated presence in WWI and today is displayed in a room in Windsor Castle in Berkshire, England.